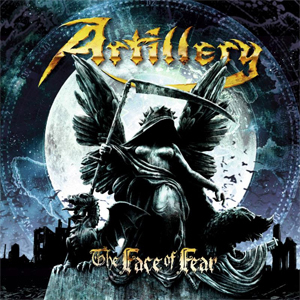 ARTILLERY Releases New Single, "Crossroads To Conspiracy"
November 16th sees ARTILLERY release their new album, The Face Of Fear - which is the successor to 2016's Penalty By Perception. The Danes have now launched the 2nd single taken off the album - "Crossroads To Conspiracy" - which can be heard below. Guitarist Michael Stutzer comments: ""Crossroads To Conspiracy" was one of the very last songs we crafted, and it's a hard-hitting melodic thrash metal song with the typical ARTILLERY riffing. The lyrics are about how you have been cursed by the wrong choices you’ve made. The wrongdoings of others that you used to condemn others for have been committed by yourself." The lyrics are ARTILLERY as you know them, with subjects concerning the destruction of mankind, double standards, abuse and the looming worst-case scenarios. The Face Of Fear was recorded with long-time producer Soren Andersen at Medley Studios. It's Soren's fifth time at the helm, and once again he manages to deliver a monster production. Soren comments: "Pure and raw! Some of the material of this album was originally written in the early 80's, and that inspired us to go old school this time. Not too many layers, just classic ARTILLERY thrash metal...And Bastholm is better than ever on this one. This is a no-filler album, created together with the band. I'm really proud of the final result and I hope everyone will enjoy it as much as I do!" "Through The Ages Of Atrocity"